These two leaves with full-page miniatures are the only surviving fragments of a Gospel book made around the year 1000 in England. The three illuminations on the two leaves show rarely illustrated episodes from the miracles and ministry of Jesus as told by the Evangelist Matthew. The style of the miniatures suggests that the manuscript was made at the scriptorium of one of the monasteries at Canterbury, which was one of the largest and most important sites of manuscript production in late Anglo-Saxon England. 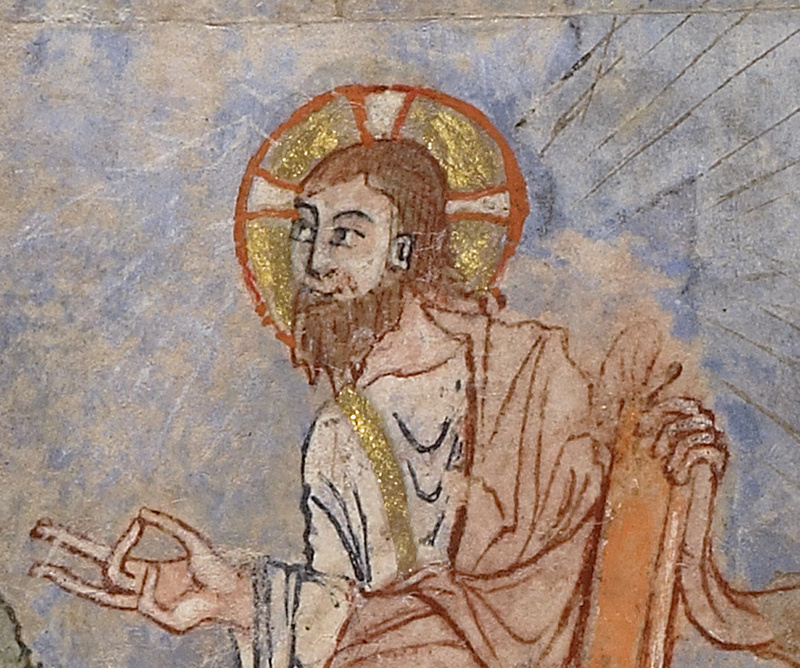 The artist used a frenetic linear style, characteristic of late Anglo-Saxon manuscript painting, to establish the lively tone of his visual narratives. Catalogue d'une vente publique d'antiquités provenant de la belle collection de feu monsieur Henry Bernard de Tracy ... vente ... 21 et 22 avril. 1952 (Gand: Louis Vanmelle, 1952), p.25. Boutemy, André. "Les feuillets de Damme." Scriptorium 20 (1966), pp. 60-65. Alexander, Jonathan J. G., and Claus M. Kauffmann. EnglishIlluminated Manuscripts, 700-1500, exh. cat. (Brussels: Bibliothèque Royale Albert Ier, 1973), pp. 27-28, no. 7. Alexander, Jonathan J. G. "Some aesthetic principles in the use of colour in Anglo-Saxon art." Anglo-Saxon England 4 (1975), pp. 150-154, figs. 4d, 8. Temple, Elzbieta. Anglo-Saxon Manuscripts: 900-1066 (London: Harvey Miller, 1976), pp. 20, 22, 72-73, no. 53. Gneuss, Helmut. "A preliminary list of manuscripts written or owned in England up to 1100. "Anglo-Saxon England 9 (1981), p. 51, no. 817. Christie's, London. Valuable Printed Books and Manuscripts. December 13, 1984, pp. 43-46, lot 123, ill. "Acquisitions/1985." The J. Paul Getty Museum Journal 14 (1986), pp. 202-3, no. 98, ill.
Ohlgren, Thomas H. Insular and Anglo-Saxon Illuminated Manuscripts: An Iconographic Catalogue, c. A.D. 625 to 1100 (New York and London: Garland Publishing Inc., 1986), pp. 136-37, no. 158. Kaufmann, Virgina R. "Iconographic Study of the Christological Cycle of Miniatures of the Aschaffenburg Golden Gospels (Aschaffenburg, Hofbibliothek Ms. 13)." Ph.D. diss. (Columbia University, 1986), pp. 132-35, 143-48, 179-84, 300-1. Raw, Barbara C. Anglo-Saxon Crucifixion Iconography and the Art of the Monastic Revival (Cambridge: Cambridge University Press, 1990), pp. 27, 83, and 225. 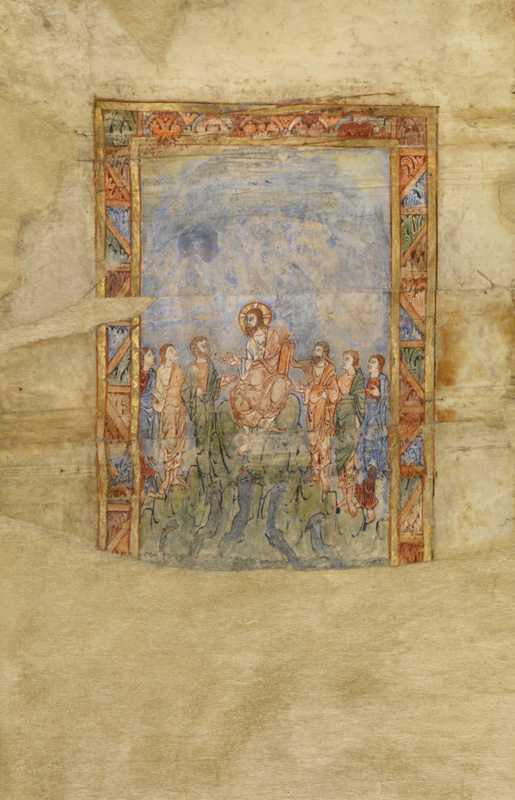 A Thousand Years of the Bible: An Exhibition of Manuscripts from The J. Paul Getty Museum, Malibu [...], exh. cat. (Malibu: J. Paul Getty Museum; Los Angeles: University of California, 1991), pl. 13. Henderson, George D.S. Review of Anglo-Saxon Crucifixion Iconography and the Art of the Monastic Revival, by Barbara C. Raw. The Burlington Magazine133, no. 1059 (June 1991), p. 389. Henderson, George. "The Idiosyncrasy of Late Anglo-Saxon Religious Imagery. "In England in the Eleventh Century: Proceedings of the 1990 Harlaxton Symposium. Carola Hicks, ed. (Stamford: Paul Watkins, 1992), pp. 239-49, pls. 19-24. Buller, Frederick. "The Earliest English Illustrations of an Angler." The American Fly Fisher 19, no. 3 (Summer 1993), pp. 2-9, ill.
Buller, Frederick. "The Earliest English Illustrations of an Angler." Flyfishers Journal 83, no. 295 (Summer 1993), pp. 33-40, ill.
Dumville, David N. English Caroline Script and Monastic History: Studies in Benedictinism, A. D. 950-1030. Studies in Anglo-Saxon History, edited by David N. Dumville, vol. 6 (Woodbridge: The Boydell Press, 1993), p. 58n259. Dumville, David. "Anglo-Saxon Books: Treasure in Norman Hands? "In Anglo-Norman Studies XVI: Proceedings of the Battle Conference, edited by Marjorie Chibnall (Woodbridge: The Boydell Press,1994), pp. 83-99. Gameson, Richard. The Role of Art in the Late Anglo-Saxon Church (Oxford: Clarendon Press, 1995), pp. 35-36, 60-61. Hoffmann, Richard C. "Economic Development and Aquatic Ecosystems in Medieval Europe." The American Historical Review 101, no. 3 (June 1996), pp. 637, ill. Masterpieces of the J. Paul Getty Museum: Illuminated Manuscripts (Los Angeles: J. Paul Getty Museum, 1997), pp. 12-13, ill., entry by Elizabeth C. Teviotdale. Lenker, Ursula. Die westsächsische Evangelienversion und die Perikopenordnungen im angelsächsischen England. Texte und Untersuchungen zur englischen Philologie, edited by Helmut Gneuss and Wolfgang Weiss, vol. 20 (Munich: Wilhelm Fink Verlag, 1997), pp. 115-17, 463-64. Hoffmann, Richard C. "The Antiquities of Angling. "In-Fisherman 23, no. 1 (February 1998), pp. 38-48, ill.
Cohen, Adam S., and Elizabeth C. Teviotdale. "The Getty Anglo-Saxon Leaves and New Testament Illustration around the Year 1000." Scriptorium 53 (1999), pp. 63-81. Budny, Mildred. "The Biblia Gregoriana." In St Augustine and the Conversion of England. Richard Gameson, ed. (Stroud: Sutton Publishing, 1999), pp. 267-68. Hoffmann, Richard C. "Economic Development and Aquatic Ecosystems in Medieval Europe." In Internal Colonization in Medieval Europe. Felipe Fernández-Armesto and James Muldoon, eds. (Farnham: Ashgate, 2008), vol. 2, pp. 123-61. Scott, Margaret. Fashion in the Middle Ages (Los Angeles: J. Paul Getty Museum, 2011), pp. 92, 95, fig. 68.